Of all the people who knew Satyajit Ray, one man still considered the last word on the filmmaker is photographer Nemai Ghosh. 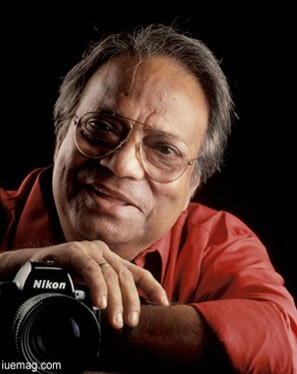 Nemai Ghosh, most eminently known as Satyajit Ray's lens man was born in the 1930's. He is a renowned Bengali man, born in the land of Bengal. He is lauded for his photography work on painting and theatre. For 25 years Nemai has taken more than 90,000 photographs and recorded almost every moment of Ray's cinematic life - his expressions, his movements, and his moods. He is still called 'Ray's photographer'. There are also photographs of actors of Bengali theatre, politicians, artists and tribals. They cover the shelves of a narrow whitewashed room in his house behind Purna theatre, in Bhowanipore, Kolkata. It's a room so narrow that besides an old television set, a table and desk, there's nothing else but the shelves that rise to the ceiling. One day in 1968, a friend of Nemai brought over a fixed-lens QL 17 Canonette camera and gifted it to him. He taught him the basics and then Nemai started working on it. That's the time that his actor-friend Robi Ghosh was shooting for Goopy Gyne Bagha Byne, a children's film directed by Ray. On a visit to the sets, Nemai took his new camera along and took some photographs of the actors rehearsing. "Banshi Chandragupta (Ray's Art Director) saw the photographs and introduced me to Manik Da [as Ray was fondly called]," he recalls. "He asked me to go ahead and take some more," mentioned Nemai. Ray was amazed to find Nemai's compositions very similar to what Ray would have done himself. That was how it all started. Years passed by while he never realized when he had become a part of Ray's unit or rather Ray's family. Nemai had access to Ray's home and sets in a way few others did. "I visited him whenever I liked, even as early as 6 am or as late as 10 pm," he says. "He would throw me a new book of photography and his wife Bijoya would bring me a cup of tea and I would sit there for long," recollects Nemai sir. In the year 2011, the 77-year old photographer launched his memoir, 'Manik-da: Memories of Satyajit Ray'. Nemai imbibed great qualities like discipline, sincerity and honesty from Ray. Throughout his career these were the qualities which helped him grow. Former to this, he produced two more books: Satyajit Ray at 70 and Satyajit Ray: A Vision of Cinema. The book Satyajit Ray: A Vision of Cinema was a collaborative project between Andrew Robinson & Nemai Ghosh. "This book is very close to our hearts," says Ghosh. Most of Nemai's favourites are compiled in this book. Nemai got the fabulous opportunity of meeting Michelangelo Antonioni while working on the book Satyajit Ray at 70, in 1991. Again he met Antonioni in 1994. Both of them maintained correspondence as Nemai went to Italy on his 94th birthday celebrations. Both Michelangelo Antonioni and Satyajit Ray were painters, apart from being film-makers. In the year 2000, a French-Belgian group came up to Nemai to make a documentary on him. As an interpreter, Kanchana Mukhopadhyay was working with this group. Kanchana came up with the idea of a book which would be a compilation of 50 photos and 50 articles. This book was first published in Bengali and then in French. Later, when Harper Collins approached Nemai for a book, he showed them the earlier version which they wanted to do in English. They added an extra to it, that is, they added the foreword by Sharmila Tagore, which is not there in the French and Bengali versions.